In 2004, the engineering giant ABB marked the 50th anniversary of its pioneering of high voltage direct current technology (HVDC). In the decade that has passed since then, we have experienced numerous new world records regarding the HVDC technology. An electric cable between Europe and America is probably becoming a question of when, not if. The first submarine HVDC cable was commissioned in 1954. The cable connected the island of Gotland (in the Baltic Sea) with the mainland of Sweden. This was a 100 kV subsea cable with a capacity of 20 MW and the length was 90 km. As earlier mentioned, this first HVDC subsea cable was constructed by ABB in 1954. Fifty years later, in 2004, ABB proudly looked back to its HVDC achievements. Which included the highest voltage cable in the world (600 kV cable in Brazil), the longest HVDC line and highest converter power rate (in China), and the world’s longest underground cable (Murray Link in Australia). Another of ABB’s achievements in its 50 year history of HVDC technology, was the world’s longest submarine electric cable; the 260 km long Baltic Cable between Sweden and Germany, which began operation in 1994. Now, a decade later, ABB still holds the world record of the longest submarine HVDC cable. It was in 2006 that construction started of the 580 km Norned cable between Norway and Netherlands. ABB supplied the main part of the NorNed cable as well as the converter stations at both ends. With 450 kV DC, the NorNed now has the highest voltage rating of all submarine HVDC cables (on pair with two other cables in the Baltic). The next world-record-length for a submarine HVDC cable will probably be a cable that will connect Norway and the UK. The cable length will be close to or a little more than 700 km. The planned capacity is 1,400 MW (double the capacity of NorNed) and the voltage 500 kV. Yet, this new cable between Norway and UK will not have the highest voltage of all submarine HVDC cables. Currently, Prysmian and Siemens are constructing the first HVDC subsea cable link in the world with a voltage of 600 kV. This project is the the 420 km UK Western Link between Scotland and Wales. This high voltage of 600 kV helps increase line capacity by 20% and reduces transmission losses by nearly a third. The Western Link will also set a new world record for capacity of subsea HVDC cables, as it will have a transmission capacity of 2,200 MW. It is Siemens that will be delivering the HVDC converter stations, and Prysmian, which will deliver the cable. The longest electric HVDC cables on land today are 2,000-2,500 km long. (cables in Brazil and China). It is unclear when submarine electric cables will be as long. But it is evident that we will soon experience subsea cables that will be more than 700 km long and operate at more than 600 kV. Predicting further into the future, it seems realistic that the development of the subsea cable technology will reflect what has been happening on land. It is probably just a matter of time until the first electrical cable will be laid across the Atlantic. Cables from Greenland to North America and/ or Europe would be 2,000-3,500 km long. A submarine HVDC cable between Greenland and Iceland could be as short as 800 km. This is a very interesting fact, as Greenland has enormous hydropower resources, that could be utilized as a a peak power source for areas in Europe (where electricity prices are among the highest in the world). 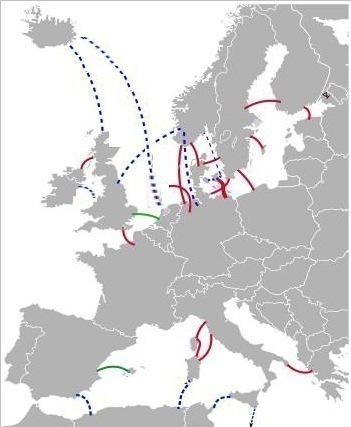 The idea of an electric subsea cable between Europe and America may sound like a fantasy. And it is quite possible that the combined length and depth will stand in the way for such a project. 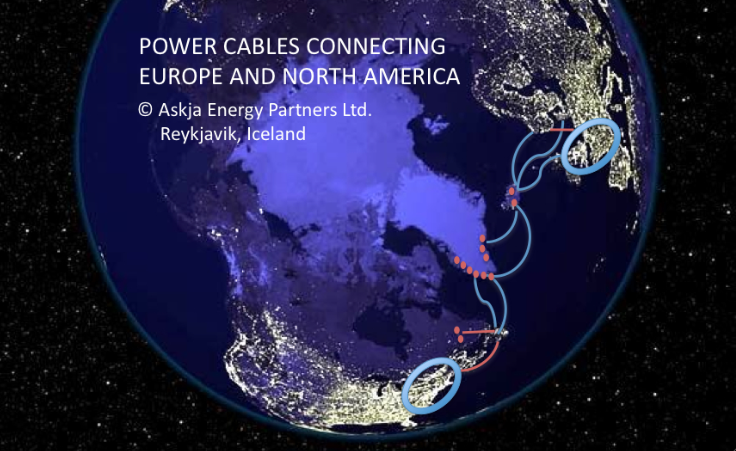 However, as 700 km subsea HVDC cables at 600 kV are becoming a reality, and the deepest subsea electric cables today are already working well at a depth in the range of 1500-1700 m, it seems that cables between Europe and Iceland, Iceland and Greenland, and Greenland and Canada (North America) are all becoming technically possible within a decade or few decades from now. Therefore, it is no surprise that it is becoming increasingly more common to see for example articles in international academic journals focusing on the potential of electric cables between Europe and North America. 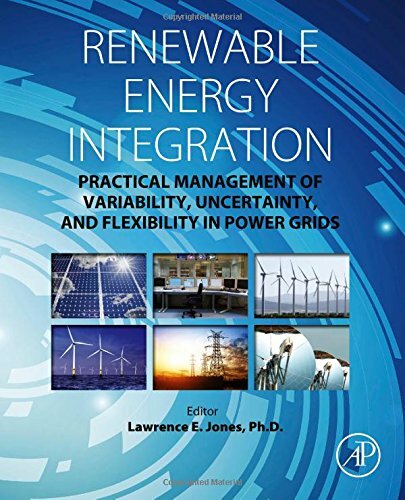 However, in the literature the focus is surprisingly often primarily on the potential of harnessing the wind power (in both Greenland and Iceland). 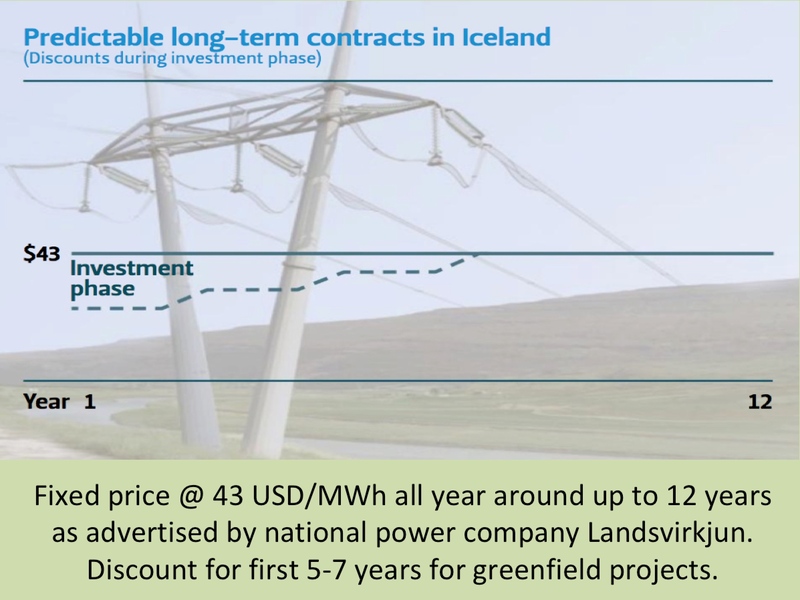 The best opportunity offered by HVDC cables connecting Greenland and/ or Iceland with Canada and/ or Europe, is definitely to utilize the great hydropower resources (and reservoirs) for high demand peak load power. The hydropower is not only a less costly process to generate electricity than wind power; hydropower is also much more reliable and controllable power source than wind. Therefore, the hydropwer has great possibilities for maximizing the profitability of energy production, by producing and selling electricity only at day time when electricity prices are highest and receive more water in the reservoirs at night time. The total hydropower resources in Greenland are believed to be equivalent to 800 TWh annually. By harnessing only approximately 1-2% of that would be enough supply more than two HVDC cables. Iceland already has a large hydropower sector, based on large reservoirs and modern generating stations, where it is possible to add capacity (turbines) at very low-cost. Thus, Greenland and Iceland could develop a perfect strategic partnership in supplying Europe with peak load energy.